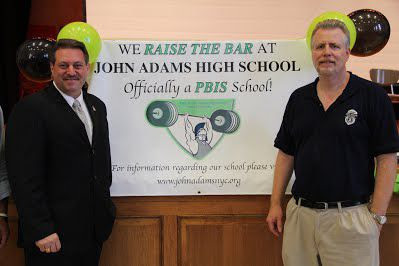 Daniel Scanlon, Principal of John Adams High School, is an example of a principal hired to close the school. Interestingly, on his Linkedin page he does not list his JD degree from Fordham University. One of the very first things he did a month after becoming principal was to charge the Dean/math teacher with incompetency and get him into a 3020-a to be terminated. This Dean/math teacher was considered the best Dean any school could ever have. This made no sense. Except if you know how the "DOE coverup to close schools" works - the process known as "Turnaround Schools" (now also called "Out of Time" schools) is a scam in New York City. The media assists the NYC DOE in publicizing all the efforts by Principals to turn around a school (when indeed the opposite is true, all covered up), and comes up with the school is beyond help, and all the teachers are excessed, but may apply to be re-hired. Dont you see that this is the goal, not improving the school? A symptom of this cancerous process is to alter testing data, numbers of special education students, and any other hard data about the performance of any person, adult or child, within the walls of the school building. 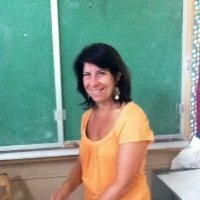 See the article posted below about Assistant Principal Breina Lampert altering Regents tests. Parents are pawns in this scam. Senator Addabbo outlined in 2011 what was happening and put a stop to the closure of JAHS until this year. Teachers at John Adams were recently told to apply to be re-hired when the school closes. Meanwhile, Scanlon set in motion a coverup of how he had, and continues to have, no management skills and/or control over the misconduct of students by charging teachers with incompetency or worse. "But some teachers argue that principals are declining to give out-of-school suspensions even when the discipline code calls for them because they doubt that department officials will give their approval. Instead, they rely on other consequences or shorter suspensions that typically keep students in school." I know for a fact that Mr. Wall did not do his research. I assisted in representing students in their Superintendent Suspensions as their representative, for 9 years. At the West 125th Street hearing office I was the only white face there, for at least 7 of those 9 years. No advocacy groups were in attendance to help the parents on the days I was there. I also research the data and facts behind each and every educator who hires me to do their 3020-a arbitration (the educator Respondent can go pro se and hire me to assist, or hire me and one of the Attorneys I work with, as the legal team). I always ask for the SOHO Reports (redacted from materials given to the attorney) in the Demand for Materials. I enjoy the DOE Attorney fighting to keep these reports out of consideration as evidence. The information gathered is presented to the Arbitrator, and if he/she will not allow the information into evidence, this still goes to an Article 75 Appeal of any arbitration decision. As far as I know, I and my team are the only people who actively seek introduction of all lawsuits, media, wrongdoing by administrators at 3020-a hearings. The reason why Principals do not report student misconduct via out-of-school Superintendent Suspensions, is that first, student suspensions are reported to the New York State Education Department and are public information. This data can put a school on the VADIR list, which puts data about a school's safety environment out to the public. No principal wants this. Second, principals get bonuses for charging teachers with student misconduct. See the case of Osman Couey. If a principal charges a teacher with misconduct, the teacher is immediately re-assigned, and then the so-called "investigation" begins, which is not an investigation at all. The agents of doom, OSI, SCI or OEO employees paid to set up the guilt of the teacher, starts and the teacher more often than not is found guilty of the actions lied about by the principal. The bonus: the teacher gets terminated, or becomes an ATR, and is off the payroll of the school. The Principal covers up the misconduct of the student(s), the parents are happy that their child/children are not labelled miscreants, and the issue is closed. Third, without senior transfers, the only way that teachers can be removed from a school's payroll is by charging the teacher with 3020-a or with discontinuance of probation. From the outside, John Adams High School in Queens looks like a poster child for New York City’s new approach to student discipline. The number of students given out-of-school suspensions plummeted from 382 in 2011 to just 28 in 2014, according to state records. A new behavior system rewards good deeds with bright green “Rack ‘Em Up” tickets, and fighting results in peer mediation and apology letters. Last year, a group of educators traveled from the Netherlands to observe the system. But several teachers at the large Ozone Park school say the changes mask serious and persistent problems with student behavior. During a single week in March, one student was found unconscious on the school’s front steps after using drugs, another student was caught with a marijuana pipe, and several students erupted into a physical altercation in a hallway, according to a school log. Though such incidents aren’t new or rare at many large high schools, some teachers at John Adams pin the misbehavior partly on recent changes in the city discipline code that restrict the use of suspensions. And as Mayor Bill de Blasio pushes schools to find alternative responses, the teachers say that administrators are increasingly wary about racking up high suspension counts. At a meeting this week at John Adams, which is under city and state pressure to make major improvements, the school’s union representative told teachers said she believed the principal was not suspending students for serious infractions because “that makes their numbers look bad,” according to an audio recording. But she said the problem goes beyond Adams’ leaders. Such complaints by teachers at John Adams and elsewhere could spell trouble for Mayor Bill de Blasio’s effort to overhaul the way the school system handles misbehavior — a policy shift that must be enacted school by school, by individual educators, and which is already under assault by pro-charter school groups that say traditional schools have become more dangerous under de Blasio. When the mayor announced the new discipline policies early last year, he insisted that schools could suspend fewer students while remaining safe and orderly. Since then, suspensions have fallen by nearly a third — a trend officials hold up as evidence that the discipline shift is taking root. But some educators are questioning that narrative. Teachers at a few schools say their principals won’t give suspensions even when warranted, inviting some students to act out and threatening their peers’ learning and even safety. Meanwhile, the principals union has suggested that the policies diminish principals’ discretion. And the head of the teachers union, the mayor’s staunch ally on most issues, has brought concerns about the policy’s rollout to the schools chancellor. Even fierce proponents of the policy change worry that schools have not received the necessary support to transform their discipline practices. Cities across the country have pivoted away from suspensions and arrests for nonviolent school offenses in recent years, fueled by research showing such “zero-tolerance” policies tend to disproportionately affect students of color and often fail to improve student behavior. While those numbers have been on the decline in New York City for several years, the de Blasio administration has made clear that they must fall even further. In February 2015, the city revised the discipline code so that principals now need approval before suspending students for insubordination. Out-of-school suspensions are no longer allowed in response to altercations that involve shoving, throwing objects, or spitting. Officials also vowed to restrict the use of suspensions and handcuffs on young children. But even when the code permits suspensions, principals are said to be under pressure to consider other options. Teachers say that district officials are more frequently rejecting schools’ requests for more serious, out-of-school suspensions, and principals union leaders say schools’ overall suspension figures are under heightened scrutiny. Advocates and even the union officials say that some oversight is justified, and that alternative responses can work better than suspensions. But some teachers argue that principals are declining to give out-of-school suspensions even when the discipline code calls for them because they doubt that department officials will give their approval. Instead, they rely on other consequences or shorter suspensions that typically keep students in school. During a fight at a small high school inside the Christopher Columbus campus in the Bronx last month, a student tried to stab another boy with a pair of scissors, according to a teacher there. The discipline code, which describes scissors as a “category II” weapon, lists an out-of-school suspension as the minimum recommended consequence for an attempted attack with such weapons. Christine Montera, a teacher at East Bronx Academy for the Future, a different Bronx school that serves grades 6-12, said she knew of several instances where the district office had denied her school’s request to issue out-of-school suspensions. She doesn’t believe it is fair or effective to suspend students for minor misbehavior, she said, but the new restrictions are creating new discipline problems. Lois Herrera, who heads the city education department’s Office of Safety and Youth Development, said the city does not factor the number of suspensions into principal or school ratings so that schools feel free to use them when appropriate. However, she said that district officials do inquire about the severity of a student’s misbehavior and the school’s other intervention attempts before approving longer suspensions. In place of suspensions, the city is prodding schools to rely more on interventions such as counseling, peer mediation, and behavior contracts, which officials and advocates say are more effective at preventing misbehavior and treating its root causes. But there’s a catch: those practices demand more time and training. Instead of just sending students to the office, a “restorative” approach calls for staffers to help students analyze poor decisions, develop a bank of better choices, and apologize for harm they’ve caused. Teachers at several schools said they have yet to receive training or to see school-wide systems of interventions and consequences to replace suspensions. Citywide, only a subset of schools has received training on restorative practices. 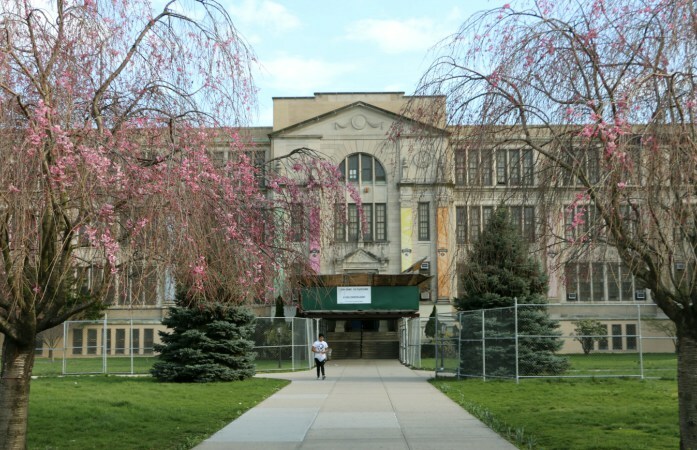 Many teachers at Lehman High School in the Bronx are uncertain about how to respond to serious behavior problems in light of the policy changes, said math teacher and union representative Jeffrey Greenberg. Staffers at the low-performing school were told to give lists of students who require emotional or academic support to the school’s nonprofit partner, but they are less sure what to do when students break rules during class that previously would have triggered a call to the dean and a suspension. Advocates have long called for the city to fund on-site coordinators at schools to oversee the conferences, training, and conflict-resolution classes that well-run alternative discipline systems demand. But only 15 schools have received funding from City Council for those positions, and city officials said they have no plans to significantly expand the number of those coordinators. At a teachers union meeting in January, 62 percent of the 414 school representatives who participated in a survey said their schools do not have enough staffers to intervene when students misbehave, and 80 percent said misbehavior was disrupting learning at their schools, according to a union report. 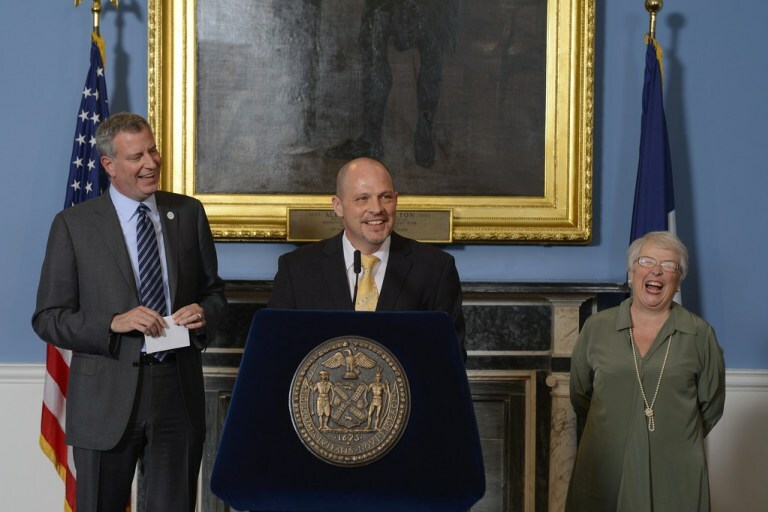 Teachers union President Michael Mulgrew (center) has raised concerns with Chancellor Carmen Fariña (right) about principals who have nearly abandoned suspensions, as well as there being too little teacher training as schools transition to alternative discipline systems. United Federation of Teachers President Michael Mulgrew has relayed concerns to Chancellor Carmen Fariña about principals who have nearly abandoned suspensions, as well as there being too little teacher training as schools transition to alternative systems. Department spokeswoman Toya Holness, who noted that crime in schools is down along with suspensions, said the city has funded 250 new guidance counselors over the past two years along with teacher training. The mayor’s preliminary budget in January included $47 million for school discipline initiatives, such as adding mental-health services, full-time social workers, and “culture coordinators” to schools with the highest suspension rates. Where some critics see the pendulum swinging too fast and far away from suspensions, proponents of the change chalk up those concerns to unavoidable growing pains as the country’s largest school system takes a radically different stance on school discipline. The restrictions on suspensions for insubordination — such as cursing at a teacher or refusing to leave a classroom — have been an especially difficult transition for teachers, some administrators say. The teachers see those incidents as undermining their authority and allowing a student to disrupt learning for an entire group. In such cases, a phone call home or a meeting strikes some teachers as insufficient. “A common complaint is that kids don’t know consequences,” said Mike Dunson, an assistant principal at Harvest Collegiate High School in Manhattan, which emphasizes restorative practices rather than suspensions. An insubordinate student may eventually face a “fairness” panel made up of students and staff or a mediation, but some teachers would prefer a more immediate, decisive response. New York Civil Liberties Union Executive Director Donna Lieberman at a 2014 rally calling for reforms to the city’s school discipline policies. Donna Lieberman, executive director of the New York Civil Liberties Union and a member of a city task force on school safety, said the city must still do “an enormous amount of work” to help schools rely less on suspensions. But she said schools were already making adjustments on account of the policy change. 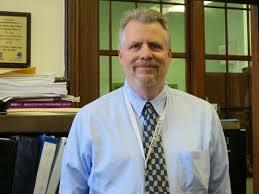 John Adams’ principal, Daniel Scanlon, did not respond to a request for comment. An education department spokeswoman said that the school administration follows protocol when responding to incidents, and that the department has provided training to help the school use “guidance interventions” and other alternatives to suspension. Outside the school last week, several students said they generally feel safe at the school and have noticed fewer fights this year. A few teachers said that any large school will have some serious incidents, and that John Adams’ positive-behavior system leaves suspension on the table even as it offers an assortment of other options. This reminds me of the story about the king not wearing any clothes. Suspensions are not only about the suspended student. Suspensions are to demonstrate to the other students and staff that there are consequences for dangerous and undisciplined behavior. Suspensions are also supposed to demonstrate that education and safety are the priorities in the schools. When students who disrupt the educational process, instill fear in students and staff, create an unsafe environment, are violent, sell illegal substances to the other students, etc. are not removed, chaos will ensue. When the rest of the school population understands that there are no consequences for violence, uncouth behavior, weapons, fights, selling drugs, threats, etc schools become inhumane and the children who attend school to learn end up suffering the most. Does anyone care about the students who attend school to learn? I find it sad and disgraceful that I even have to ask that question. 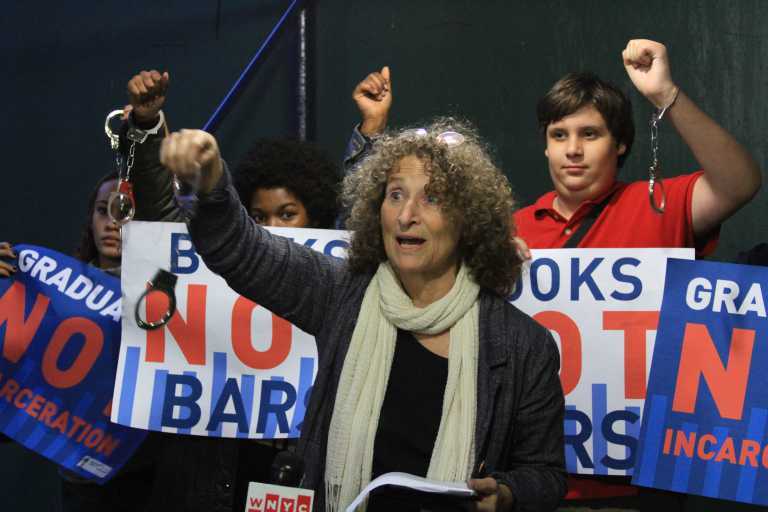 I do not need a crystal ball to predict that discipline in the NYC schools will only get worse. 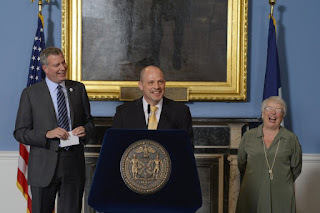 September 29, 2015 — The New York City Council is set to pass a set of sweeping reforms to the Student Safety Act that will result in increased data reporting on school discipline practices and their impact on our city’s children. The amendments will require, for the first time, reporting by both the NYPD and the Department of Education on the use of metal detectors, handcuffs and restraints in city schools. For years, schoolchildren in New York City have been subject to overly aggressive practices by police in their schools. There are more police personnel in New York City public schools than there are on the streets of almost every major city in the United States. The NYPD admits its school safety officers, who are not trained as educators, use restraints and handcuffs on kids as young as 5-years-old. Moreover, over 100,000 students in the city are estimated to walk through metal detectors to enter school every day. The Student Safety Act, passed in 2011, addresses the lack of transparency about many overly aggressive disciplinary tactics. The Act requires quarterly reporting by the Department of Education and NYPD to the City Council on school safety and disciplinary issues, including incidents involving arrests and suspensions of students. It provides the public with raw data to study the impact of disciplinary practices and, since its enactment, has lead directly to the adoption of more effective alternatives. Schools that suspend zero students. All changes are set to take effect January 1, 2016. Since 2007, the NYCLU has published four major investigations of school discipline, documenting the disparate impact of zero tolerance and street policing tactics on children of color and those with special needs. The NYCLU also filed a federal class-action lawsuit on behalf of middle and high school students who were physically abused and wrongfully arrested at school by NYPD personnel. 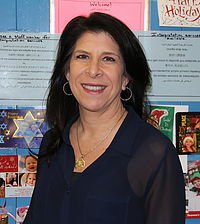 Currently, NYCLU Executive Director Donna Lieberman is part of Mayor de Blasio’s Leadership Team on School Climate and Discipline, which in July released a report that provided a roadmap to improving school climate while minimizing the use of suspensions, arrests, summonses and other excessively harsh discipline practices. During the Regents exam in August 2014, Breina Lampert, John Adams’ assistant principal for English as a Second Language, and ESL teacher Solomon Choudhury entered Room 249 while students were taking the test under the supervision of proctors, the letter said. The two stayed in the room for about 90 minutes, a witness who spoke to The Post confirmed. 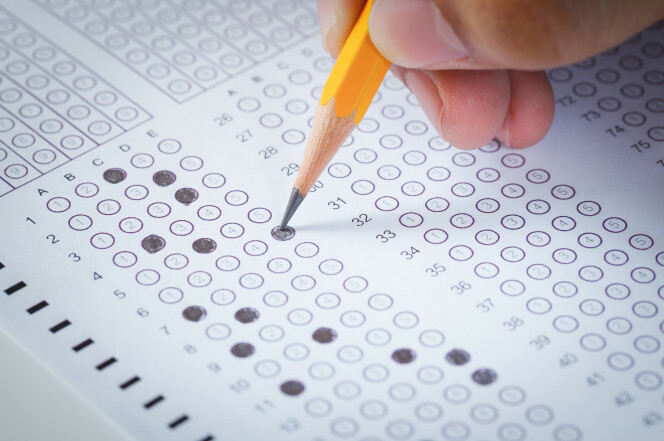 Afterward, a report listing how each student answered the multiple-choice questions showed that almost everyone in the room got No. 17 wrong — but nearly all the other answers right, the witness confirmed. “It’s a good thing that Mrs. Lampert came to our room to help us,” one student was overheard telling another, the whistleblower wrote. Then-assistant principal for security Adam Landman reported the apparent breach of protocol to principal Daniel Scanlon, who “chose to ignore” it, the whistleblower said. Instead, the principal transferred Landman to supervise an annex for ninth-graders several miles away. John Adams teachers reportedly scored the exams, despite rules forbidding teachers to grade tests from their own schools. In the second incident last January, students sitting closely in overcrowded English exam rooms shared answers, the whistleblower wrote. This time, outside graders noted “too many similarities” and refused to count the scores. Students had to retake the exam in June. This month, Lampert took 60 to 70 students — in summer school because of failing grades — on a bus trip into Manhattan to see Tom Cruise’s latest “Mission: Impossible” flick, a staffer said. DOE spokeswoman Devora Kaye would not answer any questions but said the alleged test tampering is under investigation. Lampert and Scanlon could not be reached for comment.